Sandy has been a licensed North Carolina Realtor for the past 19 Years. In order to assist with real estate buying and selling for family, friends and clients Sandy joined Jeff Scott at Scott Team Realty. Sandy and Jeff have known and respected each other for many years. Sandy and Jeff go all the way back to their high school days at Oakton High School in Oakton, Virginia. Sandy refers clients to Jeff that are looking to buy or sell on the Outer Banks. Sandy remains a part of the transaction from looking at houses and/or lots to closing and move in. Mark is always available to go with Jeff to walk lots with clients or to look at homes that a buyer maybe considering that needs to be remodeled. To provide a quality, exceptional experience that will result in having “clients for life” and numerous referrals. Sandy believes that ongoing communication is the key to a successful outcome in every real estate transaction. 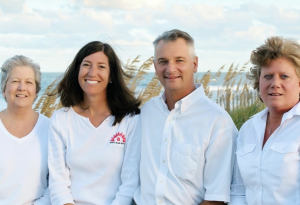 When you are looking for a Realtor on the Outer Banks contact Jeff Scott and Sandy Martin with Scott Team Realty in Southern Shores.